All tracks are $10 (taxes included) plus $6 shipping and handling to the US and Canada. 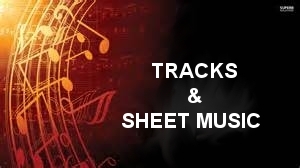 Sheet music is $4 (taxes included) plus $3 shipping and handling to the US and Canada. All other destinations, please inquire first. Songs are arranged alphabetically with a separate category of Christmas. Click song title to listen to clip. In-house tracks are available for all other songs. Please contact us for information.